Putting all of Tiger Woods’ greatest moments together is no mean feat – the Big Cat’s triumphs are on a different level. Rarely has there been anyone that has achieved so much greatness in such a short time. Anyone watching Woods in his prime would have been left stunned more than once. Woods would do things that would play on your mind for days, weeks, even years after you first saw it. Golf lovers get lost on YouTube for days watching his highlights compilation. Here are some of the most incredible moments in a career that is one big highlight reel of excellence. When Woods arrived at the Masters in 1997, his record wasn’t a great one. A missed cut and 41st finish was the best he had to show for himself. You can only imagine the shock throughout world golf after the end of the 1997 Masters. Woods won by 12 shots and set a record for the best score at -18. Tiger Mania had officially become a thing. The officials were a mixture of impressed and embarrassed. Augusta National would undergo ‘Tiger Proofing’ after that. 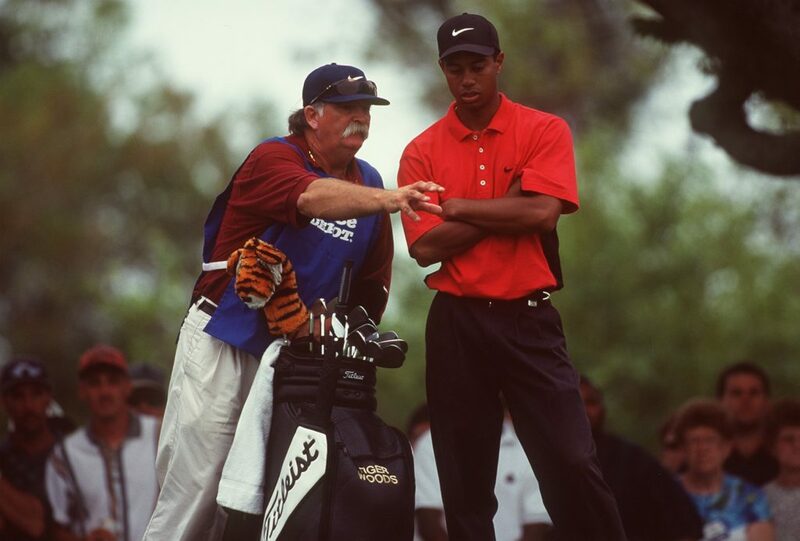 Tiger Woods with his caddy in 1997. Every Masters tournament after that for 12 years Tiger would be installed as the favourite. It’s always been tough for Tiger fans to reconcile themselves to how far he has fallen off the pace. The US Open is historically meant to be the toughest test in golf. If the organizers had the players question why they play this wretched game, then it had been a roaring success. Tiger Woods didn’t break a sweat during the playing of the 2000 US Open at Pebble Beach. Woods would win on a score of 12 under par. Only when you realize that second place was on +3 do you get a feel for Tiger’s genius. It’s those stats that make fans wonder whether there’ll ever be anyone to truly challenge the American’s greatness? When golf fans read “in your life” they automatically do it in Verne Lundquist’s voice. That is followed by goosebumps and at least an hour of reflection on that special moment. Faced with an impossible shot on the 16th at Augusta, Woods chipped the ball from a place where hope didn’t exist. Hoping to get it close and leave himself a putt for par, he did the most Tiger Woods thing he could have done. Tiger Woods in action at the 2005 Masters. The Big Cat stalked the shot for what seemed close to ten minutes. You could hear a piece of cotton wool drop as he lined up. The thousands of spectators in a hushed silence. Woods chipped it and the crowd started up, begging the ball to get close to the hole. They would get more than that as it perched agonizingly on the edge, with Verne Lundquist screaming after the ball dropped in. His famous line of “in your life have ever you seen anything like that” will last for eternity. The golfing world will always be forever indebted to Tiger for that moment. The 2008 US Open would be the last major we would see Tiger win up until the present day. Woods would overcome everything at Torrey Pines including a broken leg. The 32-year-old played through the pain barrier and none of us at home were any the wiser. It was extraordinary to find out later in autobiographies that this was the case. His putt on the 72nd hole to force a Monday playoff meant he had to endure another 18 holes in his condition. Caddie at the time Steve Williams recalls the sickening crack of bones in Tiger’s knee. Woods went on to win the contest on the 91st hole. Tiger was great but ultimately refused to lose. Broken leg? What broken leg?